My youngest kids, who turn four next month, enjoy watching the Teen Titans. Dad appreciates that, since (along with Batman) it's one of those rare cartoons that he can sit and watch with them, and not start to feel as though his brains are leaking out of his ears in the first five minutes. Bandai has been doing a very admirable job with the toy line. They have been producing a series of small (under 4") action figures, with good articulation and decent sculpting, along with a variety of fun and cool play sets and vehicles. Just the kind of thing that speaks to kids and the kids inside collectors. It also helps that they've been doing it very cheaply, something we don't see much of right now. I actually was almost sucked in at one point, and had picked up the entire first two waves...but I ended up returning them, knowing that once I was in, I would be really in, and I just don't have the space or money for another line right now. Still, I can appreciate the exceptional work up to this point. They have now released two 10" figures - Robin and Starfire. We should be seeing Cyborg show up in this format as well, and the price point is about ten bucks. They are hitting major retailers right now, like Target and Wal-mart. These come in fairly attractive boxes, just large enough to house the figure and small base. It shows off the figure well enough, and follows the same pattern as the rest of the colors and designs of the show. There's nothing outstanding, but nothing particularly disappointing. They certainly aren't collector friendly, and it will require some cutting or ripping just to get to the twisty ties, but at least the MIBBers will have an easy time storing them. 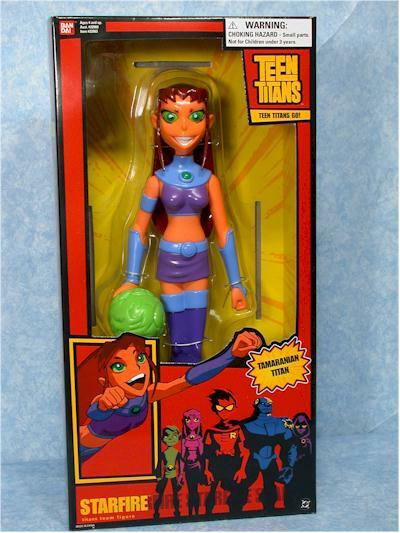 I'm only reviewing Starfire, and with good reason - her sculpt is just so goofy. All she needs is a beer and a shirt with her name on it, and she'd be on your bowling league. The head sculpt isn't bad, reflecting her bubbly personality and undying optimism. The hair was done fairly well, although it does restrict what little neck articulation there is. The body is one solid piece, with two arms popped on. Sculpting the legs together, without any sort of space between, was certainly cheaper, but that cheapness shows. Her feet aren't large enough for her to stand and hold her bowling ball, er, fireball out in front of her or behind her, so they supplied a cheap little plastic base to snap over her feet. Had the ball been removable (and yes, I believe you could cut it off if you felt strong enough about it), or had the figure been given any sort of real articulation, this wouldn't have been a problem. But that's not the case, and not only does she look cheap, the pose and design make her look silly as well. The paint ops are actually fairly decent, and on my figure, the best aspect. The lines were clean and neat, although the high gloss finish tended to add to the cheap appearance. There wasn't much bleed, and colors were bright and consistent. For a mass market figure, the ops were better than average, and actually a surprise considering the overall quality of the figure. There's a whopping three points - neck and shoulders. The neck is fairly restricted due to the hair, but you can use the shoulders to pose her in a at least one or two truly unimpressive and unappealing poses. Yes, she's rotocast. And yes, rotocast toys don't have a lot of articulation. Well, unless they are done right. There is one accessory - a cheap, thin plastic base that actually engulfs her feet like she's stepped in some sort of tar pit. This isn't even worth getting stars in the accessory category. Too bad that while she looks cheap, she isn't. At ten bucks, she's about the same price as much better 10 - 12" scaled rotocast figures. Clearly, they are a tremendous value, but she's not even average. She looks like something I'd expect to find on the shelf of a dollar store, with the name "Teen warrior!" emblazoned on the cheap box above her head. For anyone to say "these aren't that bad", is a slap in the face of a company like Toybiz that can produce a licensed figure in this scale, with good articulation, great sculpting, excellent paint, and even some accessories. Compare this to any of the 10" superhero or LOTR figures from Toybiz, and you have to realize that it's pretty much a dog chew toy. Had the paint and sculpt been slightly weaker, this would have dropped another half star. As it is, I'm probably being too generous. They do fit in okay with the Justice League stuff, but if you check my past review there, or on the 10" The Batman figure, you'll see I wasn't kind on those either. At least I'm consistent. This is clearly supposed to be a toy, but has no real play value. 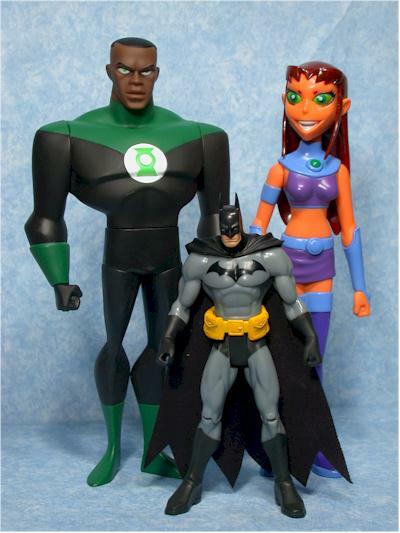 Unlike the JL 10" figures, there's no attempt to be 'maquette-like', so it doesn't even fill that particular void. Bandai has done a great job with the smaller figures, but it's pretty clear they phoned it in this time. Watch out that these don't find a way to sneak into your cart when you're not looking. These are popping up at Targets, Meijers, Wal-marts, TRU's and other major retailers right now. You'll find her with Robin, who is heavier packed and slightly better. But only slightly.